SEO is playing the major part in ranking any post on SERPs. So, more and more online business owners are relying on this influential factor in ranking their posts on top of SERPs. The initial and the most important part of SEO is its on-page optimization. Many bloggers fail to optimize their posts for search engines, thus they struggle to get organic traffic to their blog posts. Maintaining on-page SEO isn’t that hard, but it’s often forgettable. Yes, I often see that after writing a post, I’ve already missed some of the major points of on-page SEO. This is really irritating to see this sort of mistake. So, the need for maintaining SEO, especially the on-page, is very demandable. As a result, many companies have started giving services through automatic tools which will detect the lacks of proper SEO maintenance. One of these types of companies is Yoast. Yes, Yoast is too determined to serve the best for their clients when it comes to on-page SEO. Furthermore, the company has introduced its plugin for WordPress platform which is welcomed by almost all the bloggers those who use the WP as their blogging platform. I’m talking about the Yoast SEO plugin which is a must-have plugin for many of us. First of all, I wanna let you know what’s the Yoast SEO plugin. The plugin is for maintaining SEO properly so that any WordPress user can follow the crucial SEO rules in his/her blog posts. As I’ve already told you that SEO rules are often forgettable, so if you’re signaled by someone that you’re missing some points of SEO in your writing, then you can correct those mistakes. Yoast SEO plugin has a handful of great features which will always check for the proper SEO utilization in your blog posts so that you can rank them well on SERPs. I’ll share with you how I became an SEO geek by using Yoast for sure, but before I go any further, I should discuss Yoast SEO in details so that you can come to know many things about it. Do you know what is SEO plugin? SEO plugin is a type of plugin that helps its users maintain many SEO features. So if you use a nice SEO plugin on your website, you could easily handle most of the important features of SEO. You may forget to maintain some rules of SEO while writing, but having an SEO plugin means it’ll monitor your SEO performance in writing and let you know what to do further. Now I’m going for the thorough review of Yoast SEO Plugin. Yoast SEO review should be started at this point because many of you may not know about the plugin. Yoast is a company that provides different types of SEO services. This company, Yoast, has an SEO plugin which is known as Yoast SEO or Yoast SEO plugin. It’s an all in one SEO plugin. As you know that to maintain SEO, one needs to follow dozens of rules. Yoast SEO plugin is such an awesome tool that can automatically tell you what to do with maintaining a good SEO in your writing. At the bottom of WordPress writing panel, there comes the dashboard of Yoast which combines with the native WordPress dashboard. This way, the SEO plugin becomes a must-have for almost all the bloggers at the time of writing their blog posts. Stop doing these 3 SEO mistakes! These are the buttons on the dashboard. 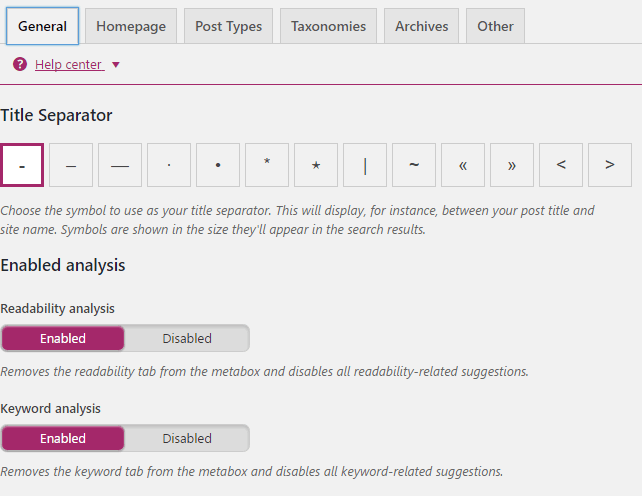 The first button “Dashboard” is to show you any problem or improvement necessary for your blog. If there’s no problem or improvement needed, then there’ll be no notifications of further actions. If Yoast finds any problem, it’ll notify you here. You should then work accordingly to improve your SEO. 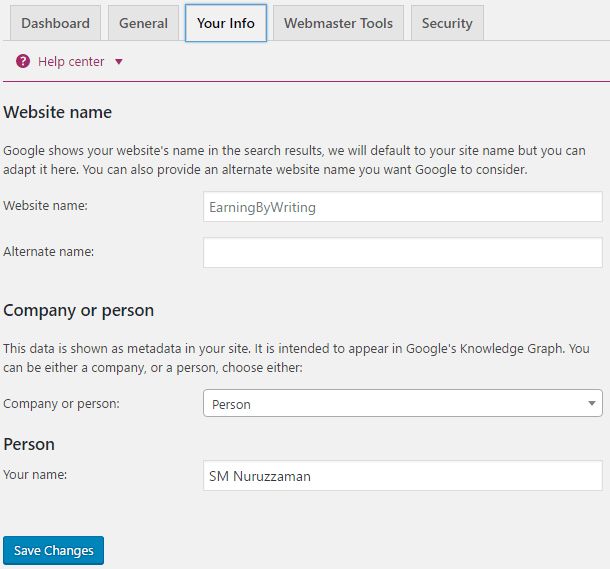 The next button “General” is for showing you how to use Yoast SEO plugin. Yoast plugin tutorial will be found here. It’ll also let you know who created Yoast. Not only is that you could also choose the default settings by pressing the button “Restore Default Settings”. The next button is “Your Info” which is for filling up some boxes with required information. Here you can see that I’ve set my blog’s name, selected whether it’s a company or person and give my name. You’ll need to put your information in the boxes. Then hit the button “Save Changes”. 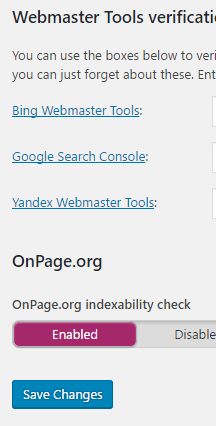 The next button “Webmaster Tools” is for verifying your blog or website for different search engines like Google, Bing, and Yandex. You can verify your blog’s identity by using this great option. You’ll just need to put the given codes on Google, Bing or Yandex and then verify accordingly. After making any change just hit the “Save Changes” button. The last button of Dashboard section is named as Security where you should leave the button “Disabled”. There are several buttons in this section. You should keep all the default settings except one in the “Archives” button. In the “Archives” button, you should make the button “Disabled” as enabling this may cause a problem like duplicated content. 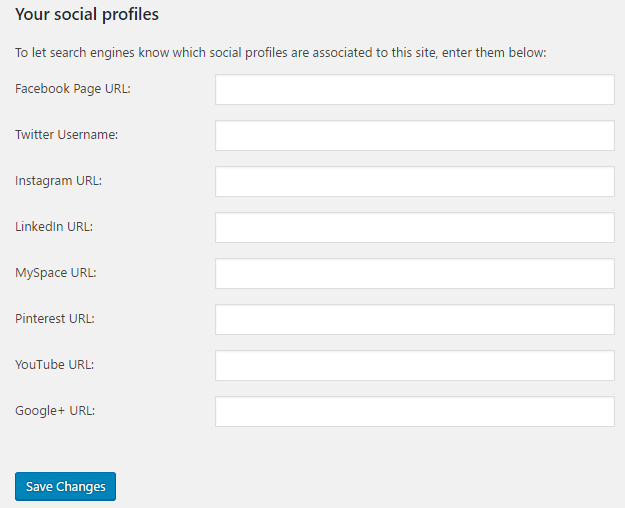 In this section, you’ll have to leave your social media’s links in the respective boxes. Put all the links if you want and then hit the “Save Changes” button. There are some other buttons on Facebook, Twitter, Pinterest and Google+ where you can add your blog’s links. This section of Yoast is very important as sitemap is necessary for your blog. 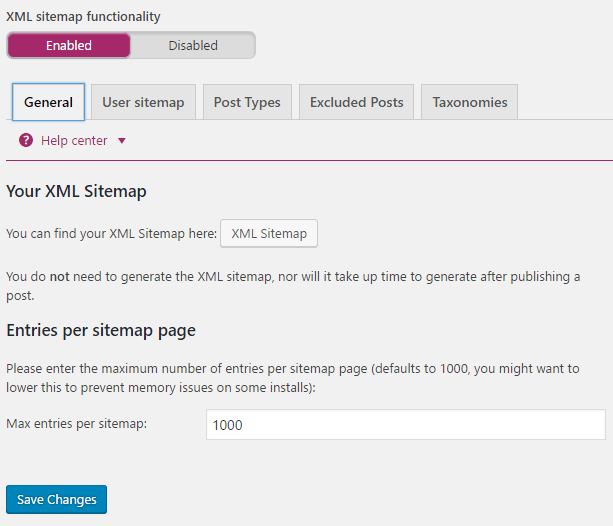 You could see your site’s sitemap by clicking on the button “XML Sitemap”. The next button is “User sitemap” where you should set the option “Disabled”. You should leave other things by default. Here you’ll have the options for opting in for Breadcrumbs, changing permalinks styles and RSS. You should set this setting as per your requirement. You’ll find different editing menus here in “Tools” section. If you need to edit, then you can use these buttons such as “Bulk editor”, “File editor” and “Import and Export”. You can add your Google’s Search Console to Yoast SEO so that you can monitor the stats directly from your blog. To do this, you’ll have to put the authorization code on Google. Follow the buttons “Get Google Authorization” and “Authenticate” to get the code and authenticate. This section will show you the benefits of Yoast SEO plugin’s premium features. You should know that there’s a premium version of Yoast which offers more facilities than the free one. 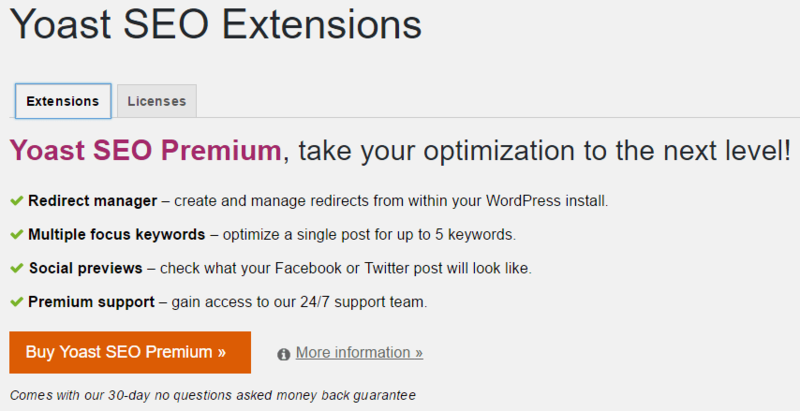 You’ll get 24/7 Yoast SEO support with the premium version of the plugin. 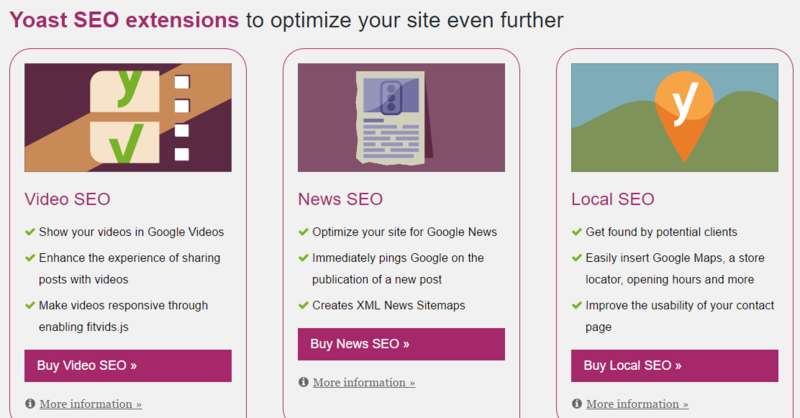 You can directly buy the premium version of Yoast SEO from your dashboard. 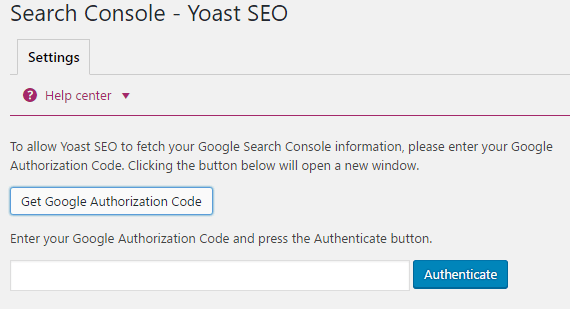 So the settings of Yoast SEO plugin are up to this. Now I’ll show you how to use the plugin at the time of writing. So this is the second part of Yoast SEO review. Though the plugin, Yoast SEO, is very effective in maintaining SEO, it has some shortcomings too. Yes, you read it right. The first objection comes to maintaining the keyword density. The suggested keyword density maintenance can be harmful to your posts. So, if you increase the number of a keyword in a post, then you could break the rule of writing naturally. In this regard, you should follow your own sense to use the main keyword a few times in the post. Another drawback of the plugin is that it can’t detect LSI keywords in a post. So, you can’t be sure whether you’ve used any LSI keyword in your post or not. Also, the plugin doesn’t count a group of words (where a keyword is present) as a keyword if there’s any word in between the words. Read: 3 Ways Yoast SEO is making you fool! Now come to the point – does Yoast SEO work? I’ll tell you my own experience with using the plugin. After using Yoast SEO plugin for many years on my WordPress blog, I can say that this is the best SEO Plugin for WordPress. 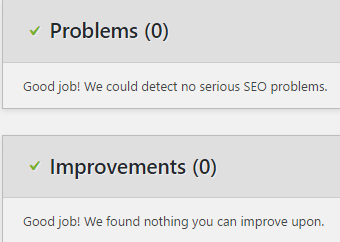 This Yoast WordPress plugin does a great job of maintaining SEO. I had to struggle a lot to maintain SEO on my blog, but now I’m completely okay as Yoast SEO plugin is there to help me almost all the time during my writing. So, this is the complete Yoast SEO plugin review and from the Yoast plugin reviews, you could use the plugin as per your need. With the plugin, you can do SEO check in no time. So, Yoast SEO plugin can be considered as one of the best SEO plugins for WordPress that comes with all in one SEO.